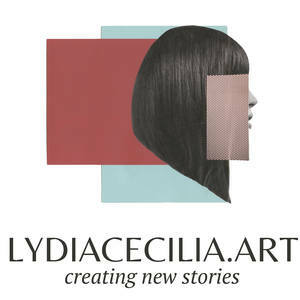 Lydia is a Spanish collage artist . She was born in 1979. She lived a few years in Dresden, Germany. Currently, she is based in Vancouver. Lydia is on a quest to understand the world surrounding us. Because of this, she choose the path of Physics, where she conducted some research in the field of Plasma Physics. She found, nevertheless, this path uncompleted, needing of an essential component. The human feelings. What moves us forward. What motivate us. What restrict us or turn us powerful. The fears, hopes, joys,..., in summary, the process of creation of a own identity. The collage, to Lydia, is a powerful tool in this quest of the identity creation. Indeed, the final image created through it is a powerful and beautiful picture of ourselves. Additionally, the collage allows us to break the preexisting hierarchies and to explore new realities. As a craftsman's granddaughter, always felt fascinated about the creation of structures which evolve to adapt to the passage of time. Lydia uses her creative process to break the preexisting roles in our society and tries to create a role-less society where to be more free and understanding. 2001 BSc Physics,University of Sevilla, Spain. 2003 MSc Plasma Physics,University of Cordoba, Spain. Jan - RAW event: Reflect, Vancouver. Apr - Pop up Market Heritage Hall, Vancouver. Nov - Publication: Artit Magazine Issue No.4 - Autumn Edition p. 23. Mar - Art on Paper | Pier 36, NYC. Apr - Art Market San Francisco | Fort Mason Center. Apr - Paste Up!, International Collage Festival, City of Mexico, Mexico.